Prove that you can handle yourself in Arkham City, and the game will let you really test your mettle. Picture the scene: You've just finished Batman: Arkham City, and you loved it so much, that you want to play it all over again. Unfortunately, you're not sure it would really be a challenge a second time, and besides, you don't really want to give up all the super cool gadgets you have. If this sounds like something that might happen to you, then fear not, for Rocksteady has just the thing for you: Arkham City's New Game Plus Mode. 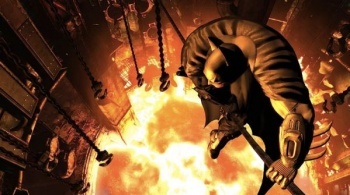 Rocksteady's Dax Ginn said that when players finished Arkham City's campaign mode, they could dive right back in with everything they've collected and unlocked. But instead of making the game easier, the tools and upgrades would be the only thing standing between Batman and a thorough pummeling. In the New Game Plus mode, Ginn said, all of the enemy configurations were different and the game didn't help you out by showing you who was about to attack. Instead, players would have to take very careful note of enemy animations, and react accordingly. Obviously the New Game Plus mode isn't going to be for everyone, but for anyone really excited about the Arkham City gameplay, it's about as close as you're going to get to actually being Batman, without having to train all your life or lose your parents in a tragic alleyway shooting.